My crappy Five Iron photo. See my Storify below for much better pics. Last night I witnessed the return of Five Iron Frenzy to the stage. 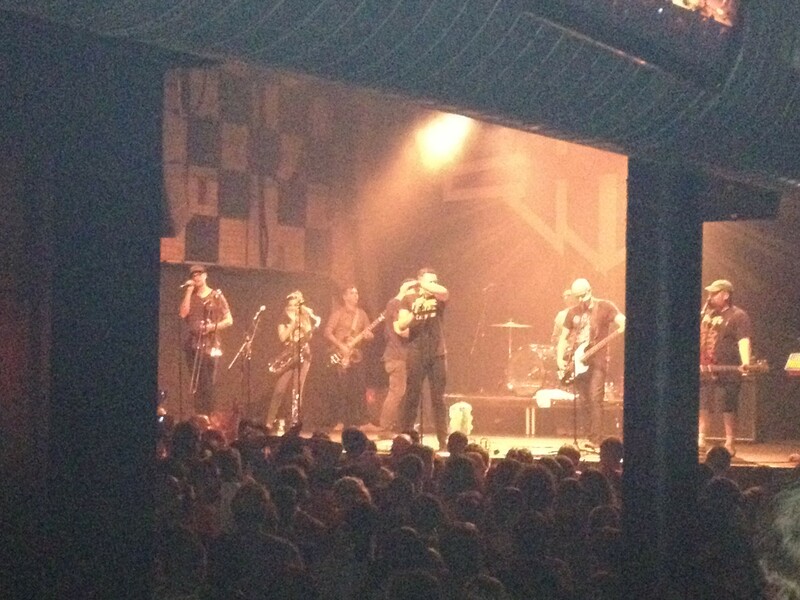 The late ’90s/early ’00s ska band played their first show in Minneapolis in nearly 10 years. The band called it quits in 2003 but came back in 2011 thanks to a successful Kickstarter campaign that raised more than $200,000 to record a new album. Since then they’ve been touring and recording said album, which is set to release in November. Five Iron Frenzy was the favorite band of my youth, the soundtrack to my high school and college years. They’re still one of my all-time favorite bands (I say that for the sake of clarification—Petra was another favorite band of my youth; not so much anymore). I reflected on what Five Iron has meant to me before, both before and after their 2003 show in Minneapolis. I spent my youth rocking out to Five Iron: Singing along in the car, learning to skank at concerts, laughing at their hilarity and feeling anger at injustice right along with them. I went to every concert I could, probably a dozen between Detroit and Minneapolis. I interviewed various members of the band nearly half a dozen times. I wrote a lengthy, self-indulgent article chronicling the band’s history back in 2003, which was mostly a form of personal therapy. So the concert last night was quite an experience. First off, I don’t go to concerts like I used to. The last concert I went to was U2, and before that I don’t even remember. Probably another U2 concert? We had to get a babysitter. When the opening band started playing I realized I’d forgotten my ear plugs. Needless to say, I was feeling old. But that’s OK. This wasn’t any concert. It was a band that broke up 10 years ago. Everybody there was old. Watching the crowd I realized Five Iron fans mostly consist of people who discovered the band while in their teens. The band was gaining those teenage fans from 1996 to 2003, which gives you age range of roughly 23-36 for your average fan. That’s about the crowd last night. Very few current teenagers. A few kids of those 36-year-old fans. A few older fans (I’d guess former youth group leaders). Some folks are feeling their age today. I also talked my wife into going with me. She went to quite a few of those shows back in the day (before we were even dating) but she was never quite the fan I was. She skipped out on the 2003 show. But I convinced her to go this time around and it was special to experience Five Iron again with her. As soon as the first song started, fan-favorite “Blue Comb ’78,” it was a singalong. The crowd sang along to every song and in most cases were louder than Reese. There was moshing and crowd surfing. I could never handle that, but my hat was off to those who were still up for it. After Five Iron played “O Canada” the audience spontaneously broke into “The Star Spangled Banner.” The band just stopped and watched in awe. It was weird and awesome. Leanor remarked that the band had never been serenaded before. In an odd moment, Reese seemed to try responding to why people started singing the national anthem and made a comment along the lines of, “You know, we don’t hate America… just Americans.” That didn’t seem to cover it, so he added, “We don’t hate them, we hate their behavior.” I can only guess that comes from some of the band’s critique of American society and values, though I’ve never interpreted that as a lack of patriotism. If anything, the spontaneous anthem felt like a tongue-in-cheek rebuke to a tongue-in-cheek song professing love for Canada. There are probably a lot of ways to take it, but I thought it was awesome. At one point Reese Roper poured one out for former Minneapolis band Ace Troubleshooter and the old Minneapolis venue the New Union. Yes, he ‘poured one out’ with water. Many a sweaty Five Iron show was played at the New Union. They played two new songs: “Zen and the Art of Xenophobia” and “So Far.” It’s always hard to hear new songs in concert, though I think the first one especially is going to be good. They also played the 11-second speed-metal scream-a-thon, “When I Go Out.” It’s not a Five Iron concert without that one. At the end of “Every New Day,” the classic Five Iron closer, Reese appeared to be overcome with emotion. He covered his eyes and crouched down on the stage while the music ended and the crowd chanted, “10 more songs!” and then went into a round of “Thank you!” I’ve seen some cool things at concerts, but seeing Five Iron fans chant ‘thank you’ to the band is pretty amazing. Glad I can be a part of that. When the show was over my wife and I went out for some late night pie, just like we used to do back in the day.